NoiseAtWork is an extremely easy to use tool for reporting any type of measurement as interpolated contours. It’s being used by industrial and occupational hygienists to help them reporting noise at work and other type of measurements in indoor and outdoor workspaces. Key words are fit for purpose, easy to use and cost efficient. 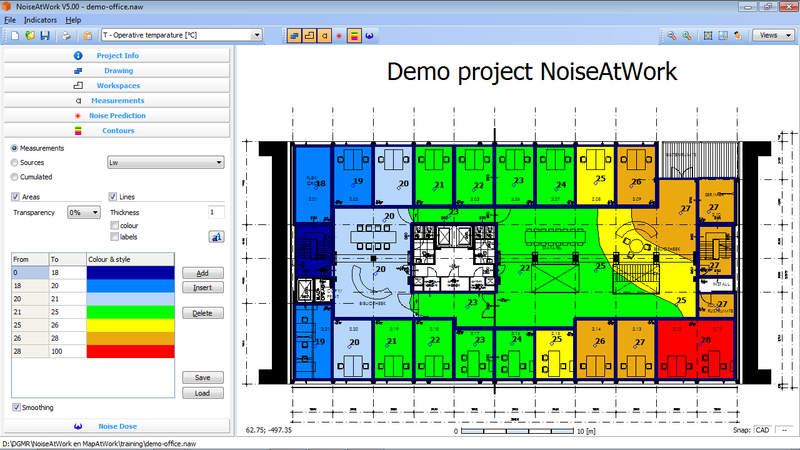 NoiseAtWork has 2 optional add-ons. Noise Dose calculations based on LEX or TWA and Noise Prediction with screening calculation according to VDI 2720.
free Companion app for digitising measurement locations on a tablet. 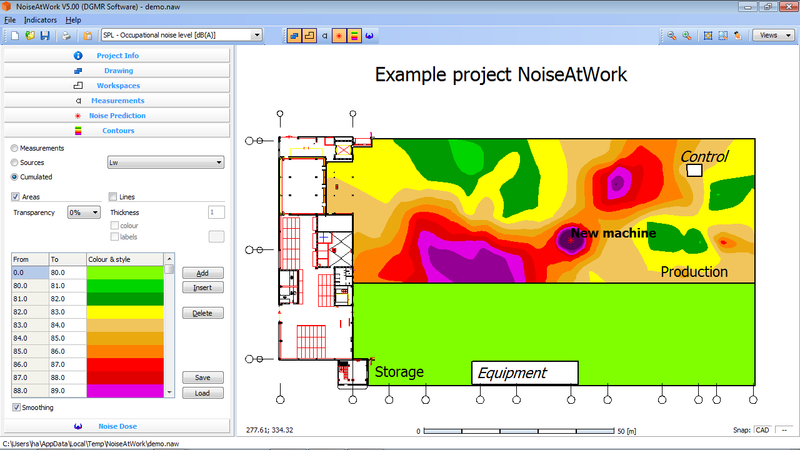 For any manufacturing or consulting company who is tired of tedious manual interpolation or hand drawing contour maps or training/learning complex and expensive mapping software I would highly recommend the NoiseAtWork software. Industrial Hygienist, The EI Group, Inc. In other general purpose interpolation software coordinates are always the time consuming part of creating an interpolated map based on measurements. With NoiseAtWork you never have to think about coordinates. Simply read in any CAD or scanned map and enter your data points by clicking on the map at the locations where you have done your measurements. This will significantly reduce the time you need to get your map done. STEP 4: click on the measurement locations and enter the results (or import from Map Companion). Automatically the contours will be shown. The interpolation method of NoiseAtWork is based on an advanced, fast and smart triangulation technique with additional smoothing option. Calculations are done automatically while entering or importing the measurement data. This means that the software is fully interactive and the effect of changes in the input data is shown ‘real time’. 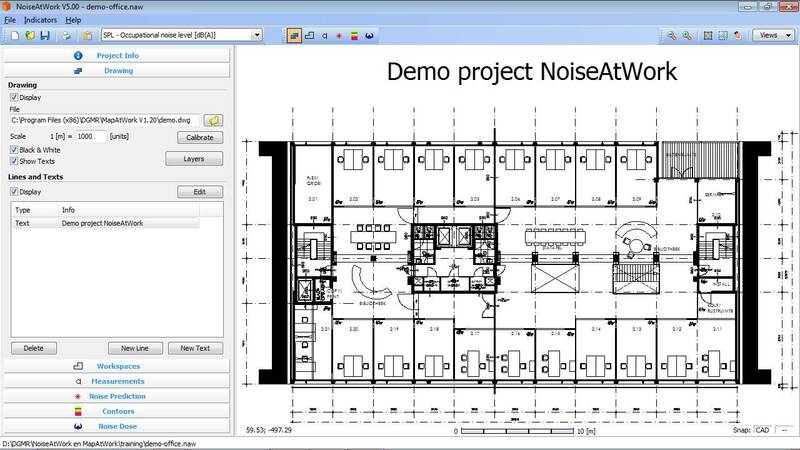 NoiseAtWork can be purchased as workstation license or network license. Also you can choose between perpetual license and 1 year subscription license. Licenses can be purchased at a local reseller as well as directly on-line using the DGMR Web shop. The Recommended Sales Prices can be found here. Support is done through helpdesk@dgmrsoftware.com and is free on the latest version. Updates (e.g. from version 5.0 to 5.1) are free.